Oreo, anyone? After a months long Developer Preview, Android 8.0 Oreo is finally here. It’s available for the Nexus 5X, Nexus 6P, Nexus Player, Pixel, Pixel XL, and Pixel C, and it’s chock-full of features like persistent notifications, battery life improvements, high-quality Bluetooth audio, and enhanced encryption. So what’s new in Android 8.1 Oreo? Here’s everything you need to know. Android 8.1 Oreo is available on the Android Open Source Project, and will roll out the update to Pixel and Nexus devices within the next week. While Google did not announce a rollout for other devices, you can keep track of when you can expect an update for your phone here. There aren’t a ton of new features in Android 8.1 compared to Android 8.0, but some handy changes have been made. For example, the preview includes a test for allowing apps to make a notification sound only once per second. Autofill is also greatly improved in the update. Perhaps the most helpful change is a battery indicator for your Bluetooth devices, which will appear next to the Bluetooth indicator in the Quick Settings. Apart from that, most of the changes are aesthetic. For example, the user interface will change based on your wallpaper. In other words, if you have a darker wallpaper, things like the quick settings menu will change to a darker gray, while they are otherwise white. That seems to only apply when the wallpaper is visible. The quick settings menu has become semi-transparent, so you will be able to faintly see what’s behind it. Next up is the Settings menu, which has been overhauled to be similar to what you’ll find on the Pixel 2 and Pixel 2 XL — making them much easier to use. Even the notifications bar has gotten a bit of an update in Android 8.1. When it’s inactive, it will now dim — which may be an attempt to prevent things like screen burn-in on the Google Pixel 2. Finally, we also have a proper Android Oreo easter egg, which you can access by going to “About phone” and tapping the Android version seven times. The easter egg basically just displays an Oreo cookie, instead of the previous Android O orange icon. The update also activates the Pixel Visual Core system-on-a-chip (SoC), which is the image processor built into the Pixel 2 and Pixel 2 XL specifically for processing photos. According to Google, that SoC will make image processing a little smoother, which could be very helpful for things like Google Lens. There are two ways to install Android Oreo: OTA (over the air, or using menus within the phone itself) or manually. OTA is the easiest — in the coming days, you’ll get a notification on your Pixel, Nexus 5X/6P, Pixel C, or Nexus Player to upgrade to Android Oreo. You’ll get the same notification if you are enrolled in the Android Beta Program. Just follow the prompts to install the update. You don’t have to wait to install Android Oreo, though. You can download factory images from Google’s Android Developer page and install it manually, but it requires a little more technical know-how. Check out our in-depth guide to installing Android Oreo for more. Don’t own a Nexus or Pixel devices? Not to worry. Google says it’s working with partners including Essential, General Mobile, HMD Global Home of Nokia Phones, Huawei, HTC, Kyocera, LG, Motorola, Samsung, Sharp and Sony to launch or upgrade devices to Android 8.0 Oreo by the end of this year. How large an impact this change will have on you depends entirely on how often you find yourself connecting to public Wi-Fi connections when out-and-about. If you’re the sort of person who likes to save their mobile data, or just doesn’t have much data to go around, then this change is likely to be a large boon to you. 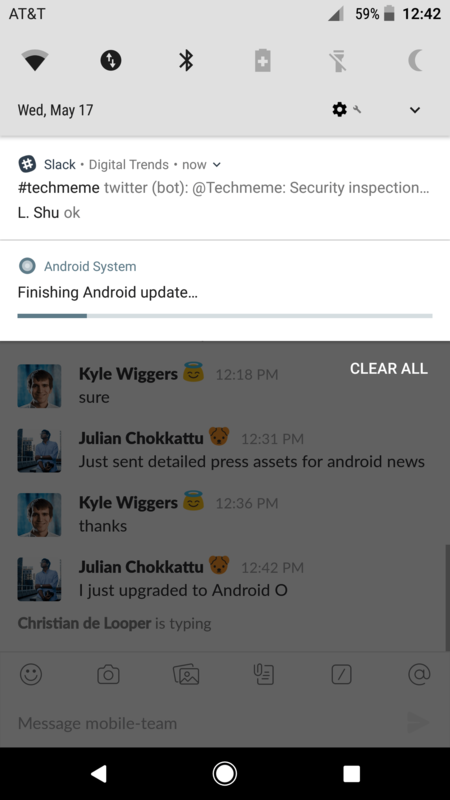 On January 22, the Android Twitter account announced that a new update for Android 8.1 Oreo would be rolling out that added speed descriptors to public Wi-Fi connections, ranging from Slow to Very Fast. Slow isn’t great for anything except Wi-Fi-assisted calling and text, while if you’re looking to stream Netflix, then Google recommends you wait until you find a Fast connection. Obviously, this could be an issue if you’re a business owner who doesn’t want to advertise that their connection is slow — so it’s also possible to opt-out of this feature if you fear it could negatively impact your business. Android Oreo doesn’t look all that different from the previous version of Android, Android 7.1.2 Nougat, but you’ll notice a few changes right away. First off, the status bar is cleaner. On the Google Pixel specifically, it’s now white with some icons moving underneath the tiles, making it easier to tap them. The Settings menu has been overhauled, as well. Compared to Nougat, there are roughly half the number of menu options. The new Settings screen layout may take some time to get used to, but most of the groupings now make more sense. If you’re a fan of emoji, you’ll like Android Oreo’s 50 redesigned emojis and support the entire catalog of emoji in the Emoji 5.0 Unicode standard. You’ll see them in the keyboard, and in apps that support the newest Android API level. Sadly, that does mean saying goodbye to the popular blob emoji. Android Oreo’s time picker — the pop-up window that apps like Calendar and Clock use to specify the date and time — now has a manual text entry mode. Tap on the new icon at the bottom left to get a text-based entry that lets you manually type in the time. One of Android Oreo’s big new features is a picture-in-picture mode that lets you see two apps at once. You can watch a YouTube video in a pop-up window while checking your email, for example, or place a WhatsApp video call while browsing the web. It should be enabled by default, but head to Settings > Apps & notifications > Advanced > Special app access > Picture-in-picture to toggle which apps can use it. Android Oreo also tweaks multi-window, the feature that lets you open two apps at once. When you open an app in multi-window and return to the home screen, a visible sliver of the app remains up top, letting you see which app you had opened. You can pull down on the black bar to preview the app’s contents, or expand it to fill the screen. Android Oreo introduces a new Google Camera app for Nexus and Pixel devices. Now, you can quickly zoom into a frame by double tapping the screen. And new icons next to the shutter button make it easier to switch between video and camera mode. There are a lot of new features with notifications in Android 8.0. Notification Dots are little dots that appear on app folders or apps indicating new notifications, such as a new email or message. They’re not unlike the red unread badges on iPhone. Press and hold the app icon, and you can see the notification as a pop-up, or find shortcuts to specific actions. For notifications that aren’t as urgent, Android Oreo lets you snooze and schedule them to reappear at a later time. It’s easy: Swipe to the right or left of a notification, tap the clock-shaped icon, and choose when you’d like the notification to show up again (15 minutes, 30 minutes, or 1 hour). Some notifications, like ongoing or persistent notifications, can’t be snoozed. Android Oreo gives developers greater control over notifications, too. They can set a time after which notifications disappear, and change the background pattern/color of notifications. Notifications in Android Oreo are organized around the idea of channels, or categories of notifications from apps. Here’s the basic idea: An airline app might have one channel for important flight alerts, and a second channel for discounts on airfare. Android Oreo lets you choose whether or not a channel can buzz your phone or jump to the top of your notifications, or lets you block channels altogether. This should help you combat notification spam. You can view an app’s channels by heading to Settings > Apps and notifications > App info, and it’s here where you can choose between five different types of alerts: No sound or visual interruption, show silently, make sound, make sound and pop on screen, or let the app decide. Be aware that developers have to implement support, so you won’t see channels for every app. Major Ongoing notifications, the highest-ranked, are for high-priority tasks like turn-by-turn navigation and music controls. People-to-People notifications include alerts from messaging apps. By the Way notifications show alerts like weather or traffic. They don’t appear on the lockscreen. General is a catch-all for notifications that don’t fit into the other three categories. Notifications that are less important are compacted to a single line and greyed out until you expand them. More important notifications, on the other hand, appear at the top of your notification shade and take up as many as three lines. Google Play Protect, a suite of security and privacy features for Android, makes its formal debut with Android Oreo. Android Oreo scans every app you install from Google Play and third-party app stores for viruses, and continuously scans your phone for trickier threats. Find My Device, which is rebranded from Android Device Manager, lets you ring, lock, or wipe your smartphone remotely. Safe Browsing protection in Chrome alerts you to websites infected with malware. Google Play Protect isn’t the only new security feature in Android Oreo. Turning on Android’s Developer menu now requires a PIN or passcode; before, you could enable it by heading to Settings > About phone and tapping on the build number a certain number of times. And Android Oreo does a lot behind the scenes. Apps can no longer take over your phone’s lock screen without permission, and they can’t use admin permission to prevent you from changing your password. And developers can’t use Android ID, the unique software identifier that fingerprints individual devices, to track users any longer. Android Oreo could mean faster updates for your Android phone. Project Treble, a re-engineered update framework, lets manufacturers modify Android independent of the specific, low-level firmware maintained by chip makers from the broader Android codebase. Previously, Android updates published by Google had to be modified by silicon manufacturers, and those silicon manufacturers had to pass the modified update to device makers. Project Treble streamlines that process with a “vendor interface” (VI) that sits between Android’s core operating system and manufacturer-specific customizations. There won’t be any user-facing changes to the way Android updates work. But in theory, phones running Android Oreo should get updates faster. Android Oreo adds a new option to the System UI Tuner, a hidden menu that gives you control over your phone’s appearance: Lockscreen shortcuts. Once you’ve enabled the System UI Tuner by long-pressing the Settings cog icon in the expanded notifications shade, you can add custom shortcuts to Chrome tabs and apps to the left- and right-hand side of your phone’s lockscreen. Android’s build-in file manager has been slightly redesigned. In Android Oreo, the Files app has replaced the old Downloads shortcut. Pressing and holding down on a file brings up an Open now menu option, and the Sorting files button is more visible. Android Oreo isn’t just about looks. It boosts your phone’s performance and battery life, too. Optimizations to Android’s core code speed up boot time. Google says that on the Pixel, Android Oreo starts up twice as fast as Android Nougat. “Wise limits” boosts battery by imposing limits on nonessential and battery-draining tasks. There are two kinds: Execution limits and location limits. Execution limits restrict apps that aren’t in the foreground from hogging resources, and location limits prevent apps from excessively querying your phone’s location services. 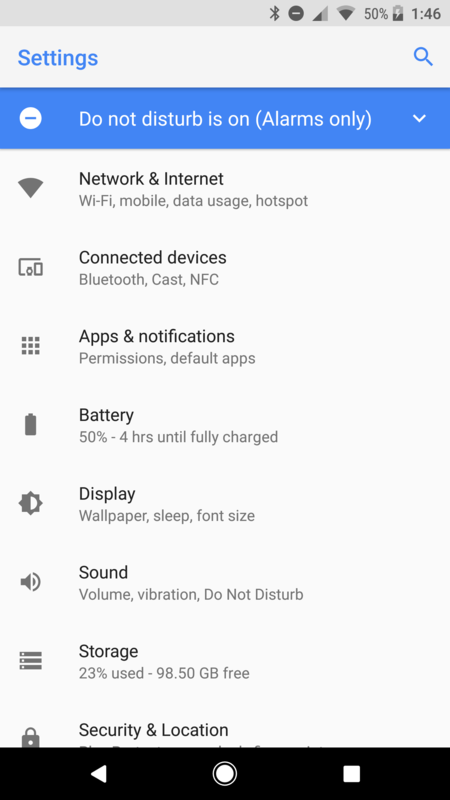 Android Oreo also introduces a new battery settings menu that lets you exercise control over power-hungry apps. You can view your phone’s power drain versus the total amount of time you’ve used it, and see a list of the most power-hungry apps. And you can drill down into individual apps to see how much battery they used in the background versus how much they used while open. Android Oreo’s Autofill feature cuts down on the number of times you have to copy text from one app to another by remembering logins and other form data. The new Autofill service lets apps register as system-wide providers of autofill services. It’s akin to selecting a keyboard — you can choose an app to keep track of your passwords, usernames, addresses, and more. Text selection is vastly improved in Android Oreo, as well. The copy-and-paste menu that appears when you select text has icons next to actions like Share and Paste. And even more usefully, it’s contextually aware — Android Oreo automatically recognizes names, addresses, phone numbers, and URLs. When you select a website link, for example, you see a menu shortcut to Google Maps, and when you select a phone number, you get a link to the dialer. Android has long been criticized for jerky animations and laggy scrolling, but Android Oreo rectifies a few grievances with new developer tools. Adaptive icons make it easier for developers to alter the shape of any given app shortcut. In Android Oreo, they can add borders with shaped masks, adjust icons to the proportions of your phone’s screen, and apply layers to use for backgrounds and ‘floating’ icons. And they don’t have to worry about animations — Android Oreo automatically adds outlines, zooms, and drop shadows as needed. New physics-based animations let app developers describe fling and spring animations and customize values like friction, velocity, range, stiffness, and dampening. The result is much more realistic momentum in app menus. Finally, Android Oreo supports wide color gamut profiles, which dictates the look and feel of certain apps. On supported hardware, developers can specify support for professional profiles like AdobeRGB and Pro Photo RGB. Wireless Bluetooth headphones, earbuds, and speakers are all the rage these days, so it’s not all that surprising that Android Oreo brings improvements to audio. Android Oreo supports Sony’s LDAC wireless codec, which streams audio at about three times the speed (990kbps) of standard Bluetooth. AptX, another low-latency Bluetooth streaming format, is also in tow. It’s hardware-dependent, but an increasing number of flagships — including those running Qualcomm’s latest Snapdragon processors — support it. Android Oreo ships with a lot of surface-level changes, but there’s just as much going on under the hood. One example is NAN, or neighborhood aware networking. NAN could allow phones and tablets to communicate without the need for Wi-Fi. Two devices can find each other and share data at high speeds, or establish a low-power connection to share small bits of data like sensor readings and location. Update: We added the news that Android 8.1 Oreo is being updated to show public Wi-Fi network speeds.